Hope Essential Oil was blended specifically to give us hope for the future on a mental, spiritual and emotional level. It reconnects us with our core strength so we can ease stress and despair. And move forward with optimism and inner power. When we feel like we are stuck and can't move forward it is so hard to look forward to our day and plan for the future. With Hope essential oil we can release those feelings and embrace life once again. Use for anytime we are going through stressful transitions, negative situations or life challenges. It is also effective for releasing irritation, anger or recovering from the effects of emotional distress or patterning. Use Hope, Joy and Gentle Baby essential oils for uplifting despair and finding our core strength again which comes from the love and joy that we are. This is an easy reference guide for Hope Essential Oil Blend. It will tell you how to use your oil blend and what to use it for. It will also provide you with some fun tips and testimonials! Want to Purchase Therapeutic Hope Essential Oil? Go to the Oil Shop! Buy Hope Oil Here! What is in Hope Oil? 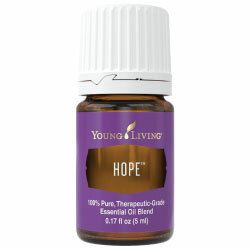 There are four therapeutic grade essential oils in Hope! They are listed below along with a brief description of each oil. Myrrh Essential Oil (Commiphora myrrha) is a very powerful antioxidant; and it is supporting to healthy skin. Spruce Essential Oil (Picea mariana) It is grounding and releasing. What are the Documented Uses for this Essential Oil? Anger, apathy, argumentative, burdens, clearing, disappointment, discouragement, overwhelmed, faith, fear, forgetfulness, frustration, grief and sorrow, grounding, hope, irritability, neglect, negative situations or circumstances, overwhelmed, stress, and transitions in life. What is the Aromatic Affect on the Mind? This wonderful aroma is calming and peaceful. What is the Spiritual Influence? This essential oil helps to release the emotions of lack of respect, anger and criticism. This will bring in positive emotions of faith, gratitude and acceptance. This is good oil for those who constantly complain and can't take responsibility for their actions. It will help you release criticism and accept things as they are. It will also help you see your own blind spots so they can be revealed and released. What Chakra is Affected? Opens the solar plexus and heart chakras. Note about Animals: Certain oils can be very toxic to cats. Citrus products and oils in particular that are not of therapeutic grade quality! Please consult your vet if you are not sure about applying any essential oil to your pet. What are the Safety Precautions? No contraindications. Possible skin sensitivity. To uplift feelings, place on ears and the wrists.